Melodious Wind Chimes by Grace Note Chimes. All sizes and tunings Available here at Will of the Wind where you can listen to their mellow tones while you shop. Grace Note Wind Chimes are made in the USA. Personalized Grace Note Wind Chimes are great gifts for all occasions. 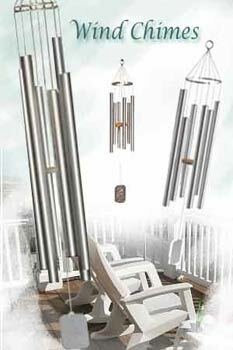 Grace Note Wind Chimes are the finest, precision-tuned wind chimes available. From the "Little" Grace Note Chimes, to the Super Chimes and Deluxe Wind Carillons, the musical quality of these wind chimes is outstanding. Gift wrapping and card available. Melodious Wind Chimes by Grace Note Chimes. All sizes and tunings are available here at Will of the Wind where you can listen to their mellow tones while you shop. This section is set up to make it very convenient for you to listen to all of the wind chimes' beautiful melodic tunings in all sizes and compare them side to side. The page also includes direct links to all sizes and styles. Or, for a quick listen, click on the little notes on this page. Enjoy being the conductor of these resonant, harmonious windchimes. Wind Carillons by Grace Note Wind Chimes are the Baritone section of the choir. Three tunings are available - Earthsong, Himalayan Echo, and Treasure of Heaven. Sound samples are available on the details pages or for side by side comparison, click on each tuning. Beautiful to look at and beautiful to hear. 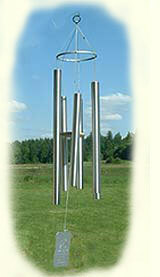 Grace Note Wind Chimes bring calm and relaxation to every environment and are never "out of tune." Another great thing about Grace Note Wind Chimes --- the manufacturer will restore your old chimes and make them "like new." No need to replace those beautiful old chimes. Here is the information you need to have your Grace Note Wind Chimes refurbished.